Summary Broadcom-based simultaneous dual-band N router with 10/100 ports. This review rounds out our complete coverage of Cisco's revamped Linksys E series of wireless routers. The E2500 is one step below the E3200, with 10/100 ports vs. Gigabit and no USB port for drive sharing. You could easily confuse the E2500 and E3200 since both enclosures are virtually the same. The main difference is the E2500's silver-gray logo band vs. the E3200's dark blue. Figure 1 summarizes the E2500's ports, indicators and switches, which are all on the rear and bottom of the device. The E2500's FCC photos were really crappy, so I opened up my review sample after testing was done. I was expecting to see a design similar to the E3200's, so was surprised to see something completely different. The E2500's designers sharpened the pencil to squeeze more componenet cost out and turned to a different Broadcom SoC as its heart. The Broadcom BCM5358U Intensi-fi dual-stream 2.4GHz 802.11n router SoC comes in flavors with and without VoIP support. The "U" version used in the E2500 is the "without" flavor. RAM size is the same as the E3200 at 64 MB, but flash has been cut in half to 8 MB. There are also no power amplifiers in those RF cans in Figure 2, just transmit / receive switches. The 5 GHz radio is the same for both, a Broadcom BCM43236. Figure 3 shows the E3200's internal view for your reference and Table 1 summarizes the key components of both products. One last difference is that the E2500 uses only two antennas per radio vs. the E3200's three. I loaded up the latest firmware (1.0.01 build 3 May 6, 2011) before testing and found that it doesn't include any IPv6 controls. One other feature that the E2500 and E3200 share is that neither will let you access the Internet unless you run the Cisco Connect software or check a box in a captive portal that says you understand that the router isn't secure (Figure 4). I've included a few more admin screens in the gallery below. 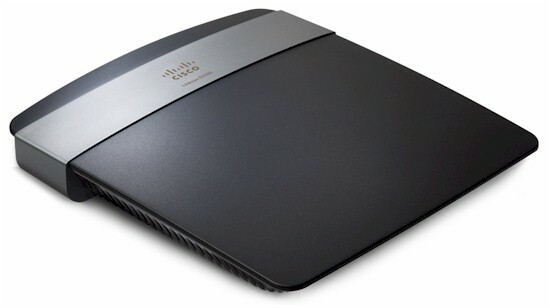 You must access the router directly or by running Cisco Connect software before you can get online. The obligatory 'proceed at your own risk' check off. The Wireless_Advanced.asp menu is not shown but can be accessed by entering the URL.